Joe Herring Jr.: Photo of the Founder of Kerrville, along with his wife and one child. 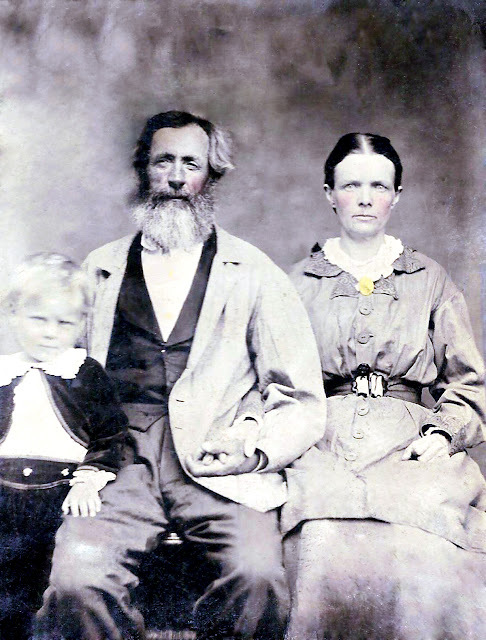 Photo of the Founder of Kerrville, along with his wife and one child. Thanks to my friend Jan Wilkinson, Kerrville finally has a decent scan of the photograph of Joshua D. Brown, his wife Sarah Goss Brown, and their young son Potter. Members of the Joshua D. Brown family, Kerrville, 1873. For those who don't remember, Joshua D. Brown was the founder of Kerrville, coming here in the late 1840s with nine others to start a shingle camp. It was Joshua D. Brown who convinced the very first Kerr County commissioners court to make "Kerrsville" the county seat, and it was Brown who sold the first lot in town, to Daniel Arnold, a bear hunter. Brown served in the army twice: first, during the War for Texas Independence, and again during the American Civil War. Ms. Wilkinson has uncovered some evidence that Joshua D. Brown was related (by family) to Major James Kerr, the man for whom Kerrville and Kerr County are named. Kerr was Brown's paternal aunt’s brother. Of course, Gonzales, in DeWitt's colony, was not all that big to begin with. Brown and Kerr must have had many dealings with each other over the years. But this new link -- that Brown and Kerr were related -- was discovered by Jan Wilkinson. Ms. Wilkinson, in turn, is related to Joshua Brown; her grandmother was Alonzo Potter Brown's daughter. Potter Brown is the little boy in the photo above. The photo above was taken just a few years before Joshua Brown's death in 1877. That's a very clear photo. Thank you for posting it. For years I've enjoyed reading your blog, Joe, and now I will also enjoy reading Jan Wilkinson's blog.